Read about the design elements included with your CMS site. In order to provide a level of consistency across UC San Diego websites and to reflect campus brand identity standards, the campuswide templates have a set of common elements. The header strip is a required element on each site. It will include the website name on the left side and the UC San Diego logo and message platform on the right. Clicking the Site Name will take the user back to that website’s home page. Clicking the UC San Diego logo will take the user back to the UC San Diego home page. In order to maintain a consistent appearance across campus websites, please do not include logos or taglines in the site or academic unit name area. Global or main navigation is persistent across the website. Blink displays first-level content in the Blink Topics drop-down and links to commonly accessed tools in the other drop-downs. 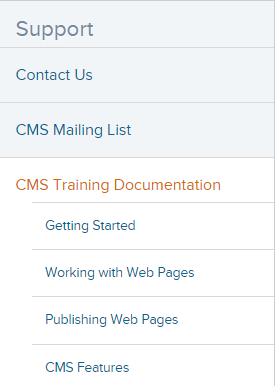 Note: Fly-out navigation deeper than one level down is not supported in the CMS. This is based on usability best practices. Sub or "left navigation" changes depending on where you are in the site. It will show the page you are on as well as the "children" and "siblings" of that page. Note: the navigation displays two levels deep on the page at a time. If the user is browsing a page deeper than the second level, they can get back to higher levels of the site through site breadcrumbs. You can include a site logo graphic above the left navigation to reinforce secondary branding. Blink and TritonLink sites already include a unique logo.